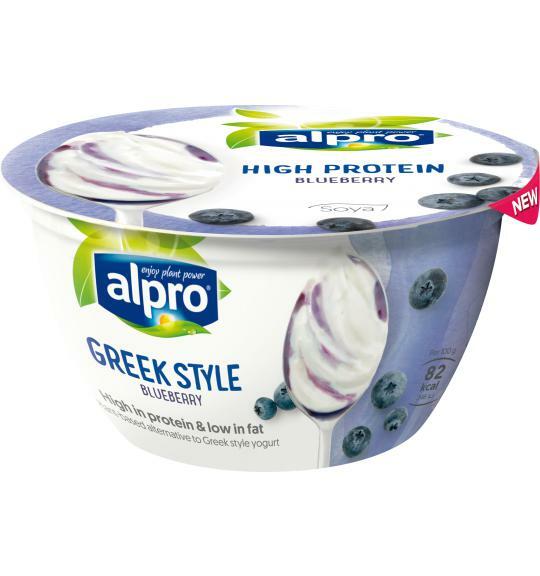 Enjoy a pick-me-up any time during your busy day with Alpro Greek Style Blueberry and packed with soya protein to keep you going throughout the day! A source of calcium, just like strained yogurt. Contains vitamins B12 and D.
May contain traces of almonds and hazelnuts. Contains soya. Free from dairy and gluten. Our body needs protein.. and quite a lot of it! Alpro Go On is packed with high quality plant protein, because soya naturally contains high levels of protein. Proteins help maintain a healthy muscle mass and contribute to muscle maintenance. Adults need an average of 50g of protein per day. It's recommended to spread it throughout the day rather than a protein peak in one meal. Move the slider to indicate your body weight and see how much protein you need daily. Why did Alpro use soya proteins instead of other plant-based protein sources? In contrast to many other plant-based protein sources, soya is a source of high quality plant-based protein. The composition of protein in soya is excellent and provides all the essential amino acids needed in a healthy diet. This is especially important for the essential amino acids, which cannot be made by the body and must be obtained by eating protein in a healthy diet. A varied, balanced diet and a healthy lifestyle are recommended for good health. What is the difference between Alpro Go On and Alpro’s regular plant-based alternatives to yogurt? The difference between Alpro Go On and our other soya alternatives to yogurt is that Alpro Go On is an alternative to strained yogurt instead of an alternative to standard yogurt. It is a product with a firmer consistency and thicker texture with an enjoyable taste thanks to its higher amount of soya proteins. Can I use Go On for sport purposes or high protein diets? Alpro Go On is not developed to be included in special diets, but it fits in to a healthy balanced diet. Consult a health care professional before you take up a special high protein diet or specific diet for sport purposes. Try these delicious recipes inspired by Alpro Go On.